Classic Empire, last year's champion 2-year-old who won Saturday's Arkansas Derby (G1), arrived at Churchill Downs on Monday morning to prepare for the Grade I, $2 million Kentucky Derby Presented by Yum! Brands on Saturday, May 6. Classic Empire, who is expected to vie for favoritism in the Kentucky Derby after his half-length Arkansas Derby triumph, was bedded down in trainer Mark Casse's Barn 36 shortly after 10 a.m. Saturday's race was his first in 10 weeks. "It was incredibly rewarding to see Classic Empire return to his full potential," assistant trainer Norm Casse said. "It was extremely frustrating and challenging this winter with his antics but it means so much to our team that he returned the way he did." The 3-year-old son of Pioneerof the Nile owned by John C. Oxley has amassed $2,120,220 in earnings with a record of 7-5-0-1, which includes a win in the Breeders' Cup Juvenile (G1) to close out his 2-year-old campaign. Classic Empire is expected to return to training Thursday or Friday at Churchill Downs. 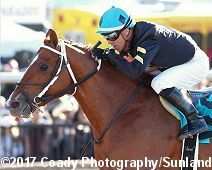 Calumet Farm's Sunland Derby (G3) winner Hence breezed five furlongs in 1:00.40 Monday morning at Churchill Downs for Hall of Fame trainer Steve Asmussen in preparation for the Kentucky Derby (G1) on Saturday, May 6. Hence breezed in company over the "fast" track at 6 a.m. with Local Hero (1:00.40) in fractions of :13, :25,40, :37 and :48.60, before galloping out three-quarters of a mile in 1:13.40 and seven furlongs in 1:27. "It's very comforting to see Hence doing well again over the Churchill surface," Asmussen said. The 3-year-old son of Street Boss has a lifetime record of 6-2-1-1 with earnings of $462,601. Kentucky Derby contender J Boys Echo recorded a half-mile move in :49.20 Monday morning at Churchill Downs for trainer Dale Romans, his first breeze since running fourth in the Blue Grass (G2) on April 8 at Keeneland. 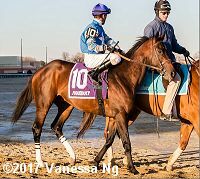 The 3-year-old colt by Mineshaft and winner of the March 4 Gotham (G3) began his workout at the three-furlong pole under Tammy Fox, who recorded splits of :12.20, :24.60 and :36.80. "I think this is the best he's looked over the track," Romans said. "This morning we just wanted to get a solid maintenance breeze in him and we'll do something more serious next week." Following J Boys Echo's breeze Monday morning, trainer Dale Romans said the Gotham (G3) winner could breeze again Sunday morning at Churchill Downs. J Boys Echo has accrued $349,600 with a lifetime record of 6-2-1-1. He is stabled in Barn 4. Janis Whitham's Blue Grass (G2) third-place finisher McCraken breezed a half-mile in :47.80 Tuesday morning at Churchill Downs for trainer Ian Wilkes in preparation for the Grade I, $2 million Kentucky Derby Presented by Yum! Brands on Saturday, May 6. McCraken, who was ridden by jockey Brian Hernandez Jr., breezed over the "fast" track through splits of :12.60, :24.60 and :36.40 before galloping out five furlongs in 1:00 and three-quarters of a mile in 1:13.40. "He felt great," Hernandez said. "Once he was a little settled going to the pole, he worked great. His gallop-out was very nice and he's right back home at Churchill where he likes it." "The main thing is I wanted to see him finish but finish without riding himself while doing it," Wilkes said. "I got everything I wanted to see today." Last week, Hernandez chose to ride McCraken in the Kentucky Derby over Louisiana Derby (G2) winner Girvin. "It was a tough decision," Hernandez said. "It was like trying to decide which one of your kids to take on vacation and which one to stay at home." "We've had a lot of success and it's been fun," Wilkes said. "Brian is a part of the team and he fits in well. He helps develop horses." The owners of Arkansas Derby (G1) runner-up Conquest Mo Money are scheduled to hold a 3 p.m. EDT news conference at Sunland Park to announce the future plans for the 3-year-old colt. Conquest Mo Money is not nominated to the Triple Crown and his owners Tom and Sandy McKenna of Judge Lanier Racing would have to pay a $200,000 late supplemental nomination to become eligible for the Kentucky Derby. Update: They announced he would skip the Kentucky Derby and train up to the Preakness. 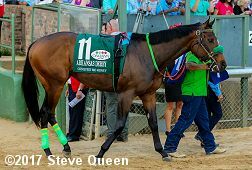 Gazelle (G2) winner Miss Sky Warrior, trained by Kelly Breen, arrived yesterday afternoon in Barn 43 at Churchill Downs and is expected to train Wednesday around 7 a.m. to begin final preparations for the $1 million Longines Kentucky Oaks (G1) on Friday, May 5. 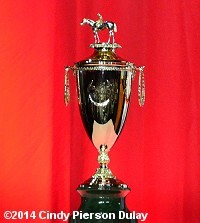 The exclusive training period for Kentucky Derby and Kentucky Oaks contenders at Churchill Downs begins Saturday from 8:30-8:45 a.m., and will be streamed live on KentuckyDerby.com. Kentucky Derby prospects expected to breeze are Girvin for trainer Joe Sharp, and State of Honor for trainer Mark Casse. Kentucky Oaks contenders that could work include Salty for Casse and Farrell for trainer Wayne Catalano. Fast and Accurate is scheduled to breeze Saturday at Trackside Louisville, Churchill Downs' satellite training center located five miles from the home of the Derby.